Portugal is extremely known to have a full coast of magnificent beaches as in the islands than on the mainland, and within the country. Take a look at the accessible beaches list, from North to South, the Azores and Madeira in 2015, choose the one you want and enjoy !! 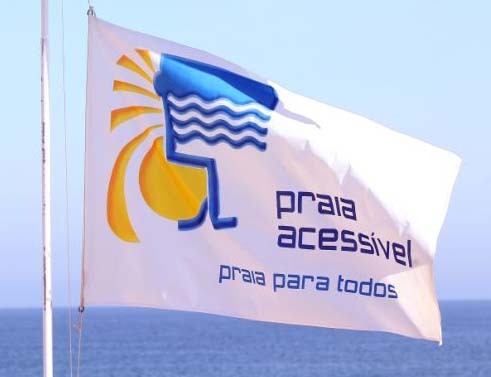 “Accessible Beach, Beach for All” Flag. The National Institute of Rehabilitation has made available a list of accessible beaches to the year 2015. All beaches present this annual list were awarded under the project “Accessible Beach, Beach for All,” which makes known the beaches that bring together the various conditions to be considered accessible. • First aid accessible Post. The program “Accessible Beach, Beach for All” initiative this year celebrates 10 years. It is the result of several partner institutions being National Rehabilitation Institute, the Water Institute, Turismo de Portugal and the Institute of Employment and Vocational Training.